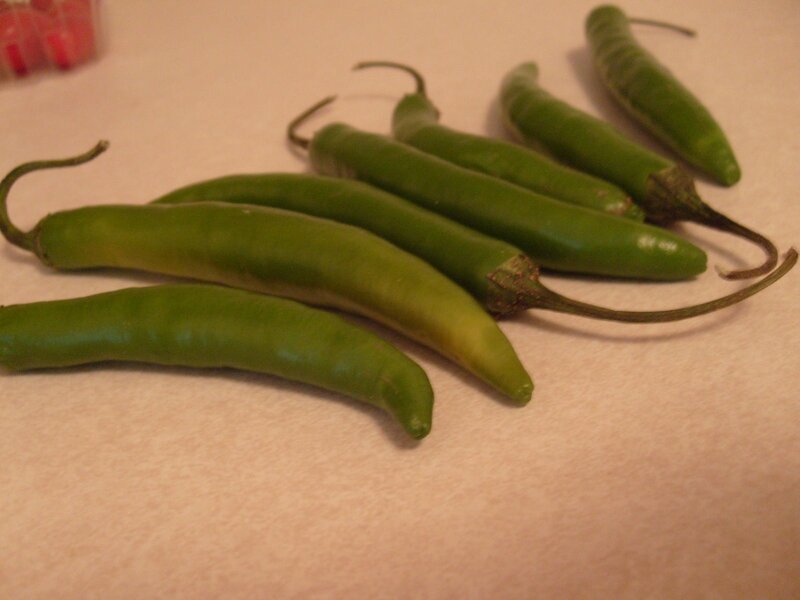 Sweet and Spicy (American) Chinese – Nutrition.Health.Life. 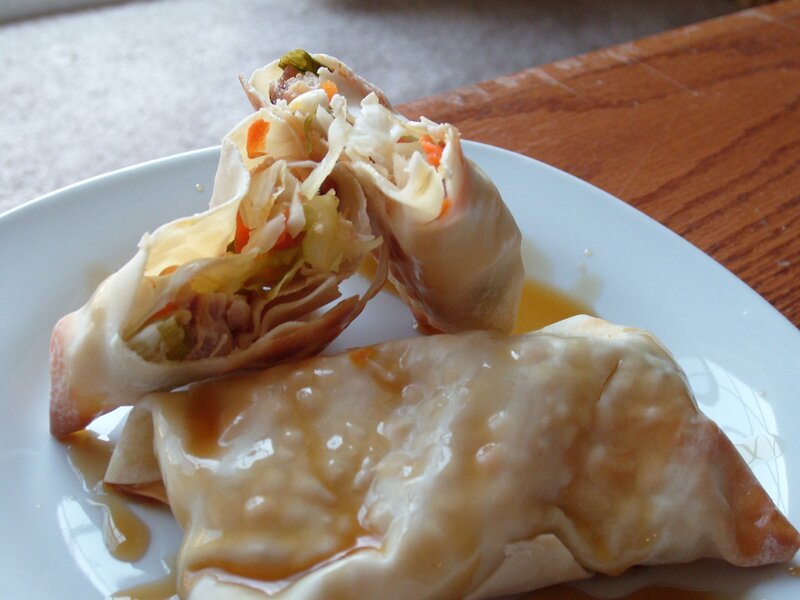 Earlier I posted about wanting to make spring rolls but never getting around to it. I don’t really like soy sauce, so I never knew what sauce I could put on them. Recently, I came across tons of amazing food blogs, one of which [cook (almost) anything at least once] had a great recipe for sweet chili sauce. It seemed simple and I have always wanted to try to make my own sauces, so I figured I would give it a try. The results were delicious. 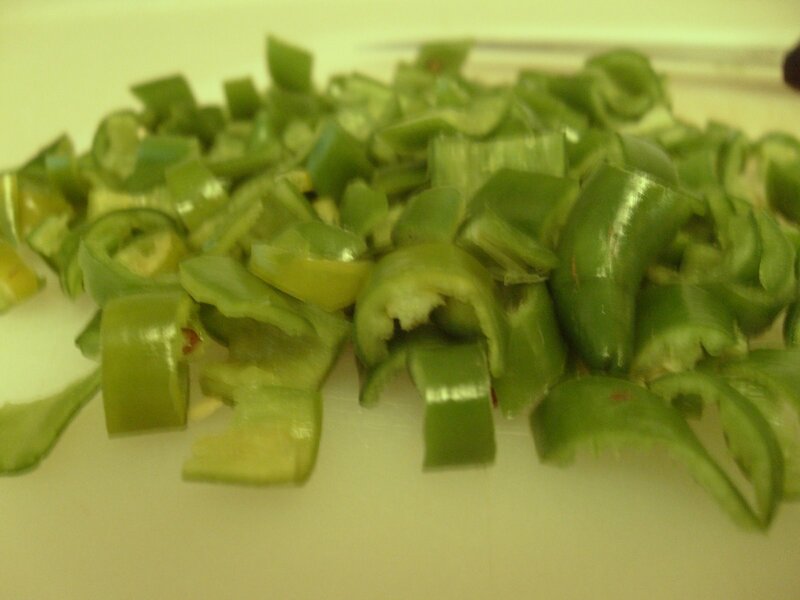 A word of caution before you start: do NOT scrape out the seeds and membranes of the peppers with your bare hand! I never worked with this kind of pepper before and had no idea about the consequences; my hand burned for over a day and ever part of my body that I touched with it burned too! I tried many wives tales, but the best solution to the burning hand was some freshly squeezed lemon juice…this worked for about 4 hours. The Mexican lady I work with suggested peeing on my hand; I guess this works for every kind of irritation! Since I was working that night (waitressing at Ruby Tuesday) I figured I better not try that method! 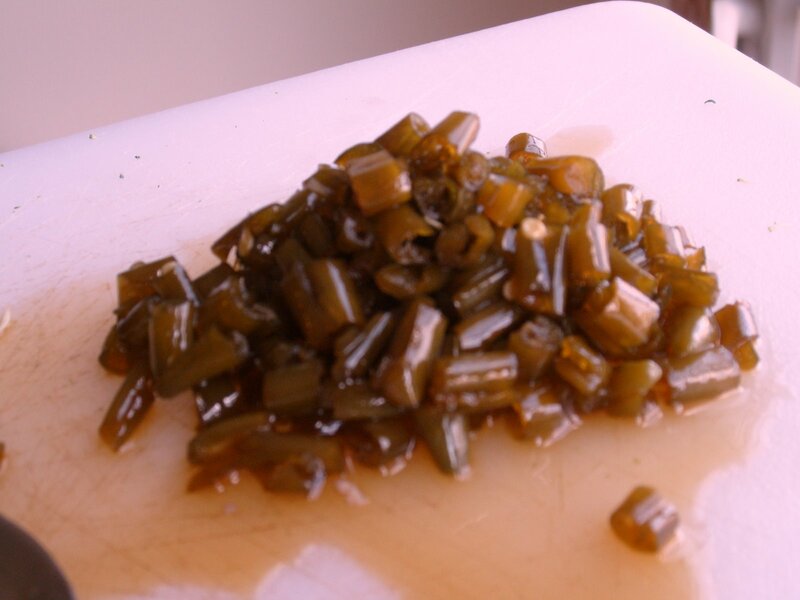 Slice the chillies lengthwise and with a gloved hand, remove the membranes and seeds. This is the part with a lot of spice in it, so if you want this to be very hot, you can leave some of this in. Dice the chillies into uniform pieces. In a sauce pan, combine chillies and remaining ingredients; simmer for at least 30 minutes. Taste the sauce to determine spiciness; if it already seems too spicy, remove chillies and continue to simmer. The longer the sauce simmers, the thicker it will get. Remember, once it is refrigerated, it will thicken even more. 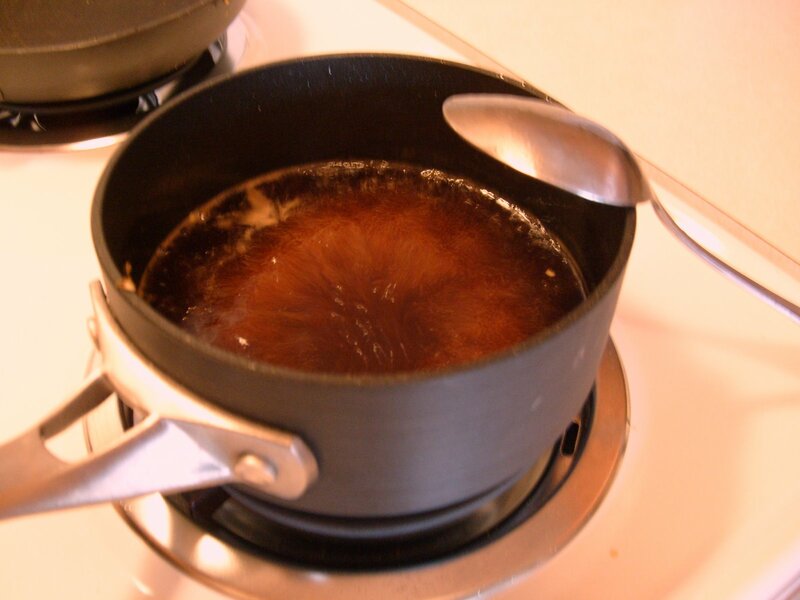 We simmered ours for 40 minutes and it is now at a consistency of a thin molasses. Spray two large baking sheets with non-stick spray. Position the spring roll wrapper like a diamond with a point facing you. 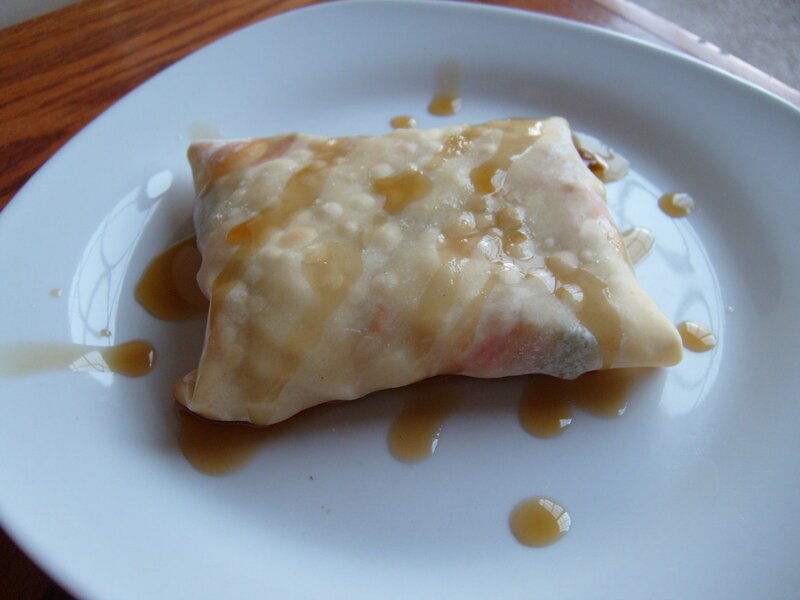 In the center of each spring roll wrapper, place about 1/4 cup of the mixture (more if it will fit). Fold the bottom corner of the wrapper up and the two side corners in. To finish, fold the top corner down and hold it there. If desired, you can seal this with some water (just dab your fingers in the water and work it into the area where the points meet). 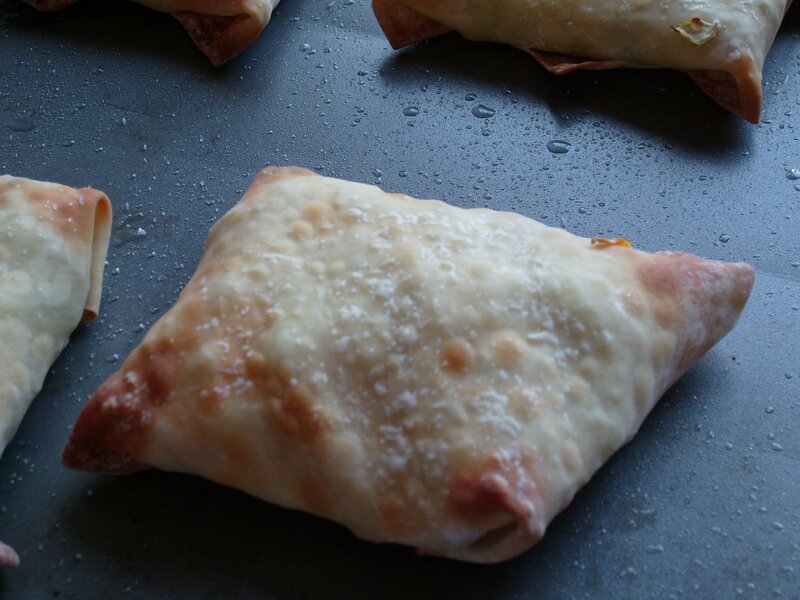 Holding the spring roll in place, pick it up and flip it over onto the baking sheet, so the folded area is hidden. Spray the tops of the spring rolls with the non-stick spray, so they will crisp-up more. Serve with sweet chili sauce and enjoy! This entry was posted in Nutrition and tagged international, side dish, vegetables. Bookmark the permalink.